Find out who will win today’s match? In Today Dream11 Fantasy Cricket Prediction RCB vs MI 31st T20 Match IPL 2018, we will cover expected playing 11, pitch report of M.Chinnaswamy Stadium, Bengaluru, toss prediction. We will also cover other details which will help you to win any fantasy leagues. The other details will include players recent and past performance, weather forecast of Bengaluru, dream11 best team and guru prediction, the best choice of captain and vice-captain for small leagues and grand leagues. All the recent and latest news and updates of Mumbai Indians vs Royal Challengers Bangalore, key players, where to watch the live match of MI vs RCB and details of live streaming. You may also like to read other IPL predictions. To win any league, you must have an idea of the above-mentioned points. We will provide you all the details absolutely FREE. You just make sure to read the complete post to get 100% benefits. All the key elements are in front of you, make the best team and enjoy. Where Can You Watch the Live Streaming of MI vs RCB or Channels to Watch? 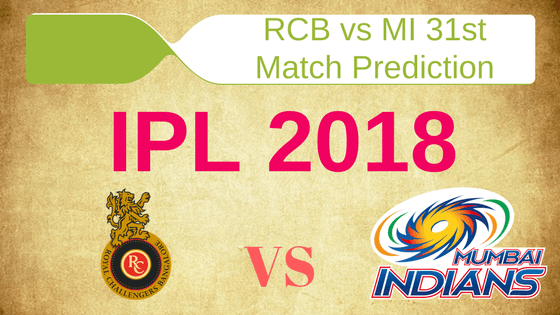 Who Will Win the 31st Match of IPL 2018 Between MI vs RCB and Toss Prediction? What is the best combination of players for Dream11 in 31st Match? Date: The match will be played on 1st May 2018 (Tuesday). Match: Indian Premier League, MI vs RCB, IPL 2018. As we have already mentioned in the previous post that the pitch of M.Chinnaswamy Stadium has two pitches. One favours the batsmen and the other favours the bowlers. If we look at the trend of previous games, on every alternate match, the pitch favoured the batsmen. Today the pitch will be same. It will favour the spin bowlers but huge runs are expected in this ground as the ground is very small as compared to other stadiums in India. In the last match, the score was below 200 so it is expected that today it will be 200+. Highest total on this ground is 202/6 in 20 overs by IND v ENG. Lowest total on this ground is 127/10 in 16.3 overs by ENG v IND. Keep your finger crossed guys as we have some good news and bad news for you. At afternoon, in Bengaluru, it will be partly cloudy and there will be scattered thunderstorms. Good news is there will be no thunderstorms at the time of the play and we can expect a full high voltage drama. The temperature is expected to be 30-Degree Celsius and the humidity to be 51%. If you are an RCB fan then you will be surprised to know that in last 5 matches, Royal Challengers Bangalore have not won a single match against MI. In overall encounters, Mumbai Indians has won 14 matches and RCB has won 8 matches. At Bengaluru, M.Chinnaswamy Stadium, the record of Kohli teams is even worse. RCB just won one game out of 8 matches. Star Sports has paid a huge amount of INR 16,347.50 Crores to get exclusive rights of IPL 2018 for live coverage for five years starting from 2018 to 2022. Star Sports has all the media rights including TV and all Digital Rights. You can watch the full match of Royal Challengers Bangalore vs Mumbai Indians on Star Sports. Ishan Kishan (wk), Hardik Pandya, Rohit Sharma (c), Pradeep Sangwan, Adam Milne, Suryakumar Yadav, Krunal Pandya, Evin Lewis, Aditya Tare, Jean-Paul Duminy, Saurabh Tiwary, Ben Cutting, MD Nidheesh, Mitchell McClenaghan, Siddhesh Lad, Mayank Markande, Mohsin Khan, Mustafizur Rahman, Jasprit Bumrah, Sharad Lumba, Kieron Pollard, Akila Dananjaya, Tajinder Singh, Rahul Chahar, Anukul Roy. Brendon McCullum, Quinton de Kock (wk), Mandeep Singh, Virat Kohli (c), Aniket Choudhary, Manan Vohra, Sarfaraz Khan, Colin de Grandhomme, Pavan Deshpande, Tim Southee, Kulwant Khejroliya, Aniruddha Joshi, Murugan Ashwin, Yuzvendra Chahal, Chris Woakes, Umesh Yadav, Moeen Ali, Mohammed Siraj, Washington Sundar, Corey Anderson, AB de Villiers, Pawan Negi, Navdeep Saini, Parthiv Patel. Both the teams are in the same boat with just two wins. MI and RCB have to win this match anyhow but the result will go in favour of one team only. It will be interesting to see which team utilizes their player and win today’s match. AB de Villiers didn’t play the last game which cost RCB with a loss. There is a high chance that he will return in the playing 11 today. McCullum may retain his place and Washington Sundar may get a chance in place of Manan Vohra. Brendon McCullum, Quinton de Kock, Tim Southee, AB de Villiers/Manan Vohra, Mohammed Siraj, Virat Kohli, Yuzvendra Chahal, Colin de Grandhomme/Washington Sundar, Umesh Yadav, Mandeep Singh, Murugan Ashwin. Note: If AB de Villiers didn’t pass the fitness test then Kohli may go with the same playing 11. MI won the last match and this would have definitely boosted Mumbai Indians confidence. Rohit Sharma will definitely want to continue with the same playing 11. Rohit may think of bringing Mustafizur Rahman in place of Ben Cutting. Ishan Kishan (wk), Suryakumar Yadav, Jean-Paul Duminy, Evin Lewis, Krunal Pandya, Jasprit Bumrah, Ben Cutting/Mustafizur Rahman, Rohit Sharma (c), Mayank Markande, Hardik Pandya, Mitchell McClenaghan. Pro tips: Both the players are equally important and top order batsmen. Make a combination of the above players for multiple teams. Pro tips: Rohit will play at 1 down so try to keep him in your teams. Make a combination of the above players for multiple teams. Pro tips: Try to keep Krunal in your teams. Make a combination of the above players for multiple teams. Pro tips: Try to keep spinners in your teams as the pitch will support spinners more. Make a combination of the above players for multiple teams. Pro tips: The above players are most likely to perform. You can take them as a captain and vice-captain. You can also take captain from key players. RCB is at 7th and MI is at 6th position in the points table. Both the teams have to win all the matches if they want to stay in the fight. All the cricket experts are saying that Mumbai Indians has an upper hand and they will win but according to our astrology prediction, Royal Challengers Bangalore will win the match. Winning the toss and opting to bat first will be a smart move. If you go by our astrology prediction, RCB will win the toss and they will ask MI to bat first. In Bangalore, JP Duminy has an outstanding record, so you can keep him on your team. RCB may go with many changes, so try to select safe players who have a high chance of playing. Conclusion: This is it for Today’s Dream11 Fantasy Cricket Match Prediction of RCB vs MI, 31st T20 Match, IPL 2018 which will be played on Tuesday 1st May. You can give your valuable feedback in the comment section. Subscribe to our notification of latest updates. GOODBYE!